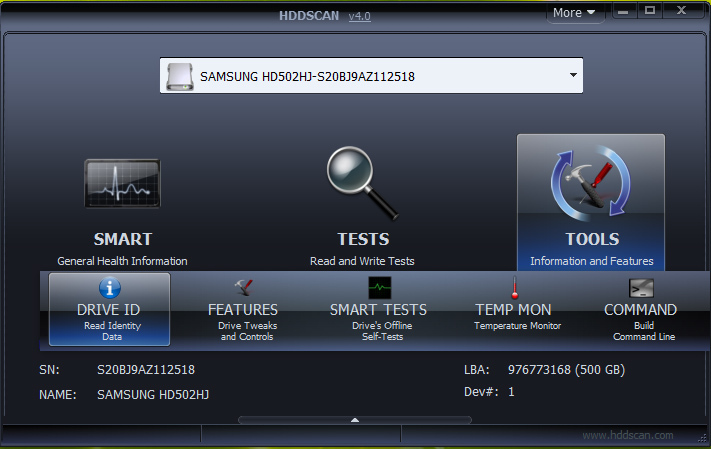 HDDScan Terbaru merupakan software yang berguna untuk membantu anda mendeteksi kesehatan hardisk ataupun SSD. Program ini dirancang untuk memeriksa hard drive dan SSD mengalami Badsector atau tidak, view SMART attributes, mengubah pengaturan khusus seperti Power Management, start / stop spindle, adjust the acoustic mode, dll. Memberikan nilai suhu drive HDD atau SSD ke taskbar windows. HDD with ATA / SATA interface. HDD with USB interface (see Appendix A). HDD with FireWire or IEEE 1394 interface (see Appendix A). RAID arrays with ATA / SATA / SCSI interface (only tests). Flash drives with USB interface (tests only). SSD with ATA / SATA interface. Test in the mode of linear verification. Test in the mode of linear reading. Test in linear recording mode. Reading and analyzing SMART parameters from ATA / SATA / USB / FireWire drives. Reading and analyzing log tables from drives with SCSI interface. Launch SMART tests on ATA / SATA / USB / FireWire drives. Temperature monitor on drives with ATA / SATA / USB / FireWire / SCSI interface. Reading and analysis of identification information from drives with ATA / SATA / USB / FireWire / SCSI interface. Change the parameters of AAM, APM, PM on drives with ATA / SATA / USB / FireWire interface. View information about defects on a drive with a SCSI interface. Start / stop spindle on drives with ATA / SATA / USB / FireWire / SCSI interface. Saving reports in MHT format. Support for SSD drives (NEW). Buat kamu yang ingin men-Download HDDScan ini secara gratis silahkan menuju link dibawah, dan yang mendapat masalah saat mendownload ataupun menggunakannya mohon untuk memberi komentar dibawah agar saya bisa membantunya. 0 Komentar untuk "HDDScan 4.0 Terbaru"